Manafort, sitting in a wheelchair as he deals with complications from gout, had no visible reaction as he heard the 47-month sentence. While that was the longest sentence to date to come from special counsel Robert Mueller's probe, it could have been much worse for Manafort. Sentencing guidelines called for a 20-year-term, effectively a lifetime sentence for the 69-year-old. Manafort has been jailed since June, so he will receive credit for the nine months he has already served. He still faces the possibility of additional time from his sentencing in a separate case in the District of Columbia, where he pleaded guilty to charges related to illegal lobbying. Before Judge T.S. Ellis III imposed the sentence, Manafort told him that "saying I feel humiliated and ashamed would be a gross understatement." But he offered no explicit apology, something Ellis noted before issuing his sentence. Manafort steered Donald Trump's election efforts during crucial months of the 2016 campaign as Russia sought to meddle in the election through hacking of Democratic email accounts. He was among the first Trump associates charged in the Mueller investigation and has been a high-profile defendant. But the charges against Manafort were unrelated to his work on the campaign or the focus of Mueller's investigation: whether the Trump campaign coordinated with Russians. Manafort's lawyers argued that their client had engaged in what amounted to a routine tax evasion case, and cited numerous past sentences in which defendants had hidden millions from the IRS and served less than a year in prison. Prosecutors said Manafort's conduct was egregious, but Ellis ultimately agreed more with defense attorneys. "These guidelines are quite high," Ellis said. Neither prosecutors nor defense attorneys had requested a particular sentence length in their sentencing memoranda, but prosecutors had urged a "significant" sentence. Outside court, Manafort's lawyer, Kevin Downing, said his client accepted responsibility for his conduct "and there was absolutely no evidence that Mr. Manafort was involved in any collusion with the government of Russia." Prosecutors left the courthouse without making any comment. Though Manafort hasn't faced charges related to collusion, he has been seen as one of the most pivotal figures in the Mueller investigation. Prosecutors, for instance, have scrutinized his relationship with Konstantin Kilimnik, a business associate U.S. authorities say is tied to Russian intelligence, and have described a furtive meeting the men had in August 2016 as cutting to the heart of the investigation. After pleading guilty in the D.C. case, Manafort met with investigators for more than 50 hours as part of a requirement to cooperate with the probe. But prosecutors reiterated at Thursday's hearing that they believe Manafort was evasive and untruthful in his testimony to a grand jury. Manafort was wheeled into the courtroom about 3:45 p.m. in a green jumpsuit from the Alexandria jail, where he spent the last several months in solitary confinement. The jet black hair he bore in 2016 when serving as campaign chairman was gone, replaced by a shaggy gray. He spent much of the hearing hunched at the shoulders, bearing what appeared to be an air of resignation. Defense lawyers had argued that Manafort would never have been charged if it were not for Mueller's probe. At the outset of the trial, even Ellis agreed with that assessment, suggesting that Manafort was being prosecuted only to pressure him to "sing" against Trump. Prosecutors said the Manafort investigation preceded Mueller's appointment. 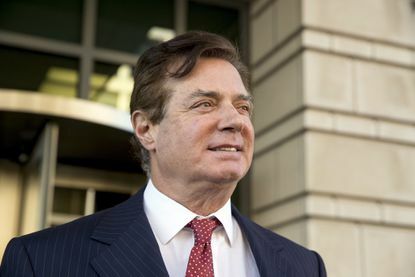 The jury convicted Manafort on eight felonies related to tax and bank fraud charges for hiding foreign income from his work in Ukraine from the IRS and later inflating his income on bank loan applications. Prosecutors have said the work in Ukraine was on behalf of politicians who were closely aligned with Russia, though Manafort insisted his work helped those politicians distance themselves from Russia and align with the West. In arguing for a significant sentence, prosecutor Greg Andres said Manafort still hasn't accepted responsibility for his misconduct. "His sentencing positions are replete with blaming others," Andres said. He also said Manafort still has not provided a full account of his finances for purposes of restitution, a particularly egregious omission given that his crime involved hiding more than $55 million in overseas bank accounts to evade paying more than $6 million in federal income taxes. The lack of certainty about Manafort's finances complicated the judge's efforts to impose restitution, but Ellis ultimately ordered that Manafort could be required to pay back up to $24 million. In the D.C. case, Manafort faces up to five years in prison on each of two counts to which he pleaded guilty. The judge will have the option to impose any sentence there concurrent or consecutive to the sentence imposed by Ellis.